Everyone knows how hard is to keep your computer fast and stable. You have to keep your software up-to-date, always uninstall useless applications, remove malware, etc. All in all, it seems that you have to be a computer technician to keep your computer safe and clean. Having this in mind, nearly one year ago eSolutions presented an exceptional project, which is dedicated to helping people fix their computers for free. It’s called UGetFix.com. 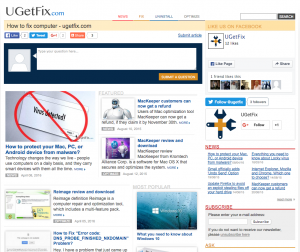 The site is composed of several categories: News, Fix, Uninstall, Recover, and Optimize. It is full of helpful information, which is oriented to both, Windows OS and Mac OS X. We are working very hard on this project and hope that it soon will appear in your Bookmarks!